A primary goal of Spring is to keep components as independent as possible, which allows these components to be reused , and also provides possibility to unit test them independently. Spring Dependency Injection principal fulfill this goal via injecting the dependency one component might need to complete its job, rather that component itself finding it’s dependency. In this post we will focus on XML based configuration.Check out Annotation example as well. Let’s get going. In this approach, dependency is injected/provided using Setter Method. Property Setter approach is more widely used in industry and simple to understand. 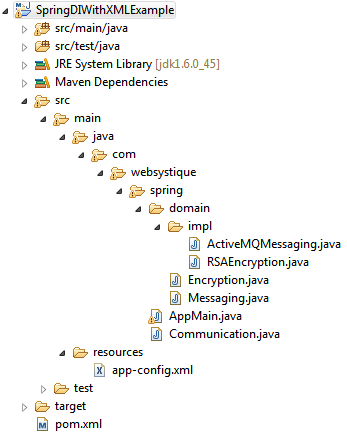 In above XML configuration, Spring will inject ‘activeMqMessaging’ bean into ‘communication’ bean using setter dependency injection. Communication’s setter method [setMessaging(Messaging messaing)] will be called to set the property. In this approach, Spring injects the required dependency via Constructor argument[s]. In above XML configuration, Spring will inject ‘rsaEncryption’ bean into ‘communication’ bean using constructor dependency injection. Communication’s one arg Constructor[ Constructor(Encryption encryption)] will be called. Remark: Although constructor injection seems simple, it can easily lead to infamous constructor ambiguities in case you have multiple constructors with same number of arguments but different types and if implicit conversion is possible between different types. It happens mostly with primitive type (int, String etc..). You can get rid of these ambiguities using ‘type’ attribute of constructor-arg element to specify exact type of argument e.g. It is also possible to use them together in same bean, although on different items. In above configuration, we are using Property Setter approach to inject ‘activeMqMessaging’ bean into ‘messaging’ property. On the other hand, we are using Constructor Injection approach to inject ‘rsaEncryption’ bean into Communication constructor.